Does everyone know about wheat berries? I’m guessing not, because I’ve mentioned them to several people in the last few days, and all they gave me a blank stare. “Berries made from wheat? That can’t be good…” If that’s you, please write this one down on your grocery list, and promise you’ll try it! I’ve been really making an effort to educate myself on the “new” grains that are popping up everywhere. Some of them are actually ancient grains, as in, “I’ve been around for thousands of years, where have you been?” Others aren’t really all that old, but they’ve just recently become popular. I believe wheat berries fall into the later category (but maybe someone from the Whole Grains Council can correct me if I’m wrong). They are simply, the entire kernel of wheat – bran, endosperm, germ and all, without any stripping or refining. That means, dear reader, they are good for you! You see, all of the good (ie healthy) stuff is actually in the outer bran and inner germ of the wheat kernel, so if you’re eating regular refined white flour, or anything made from it, you’re missing out. Wheat berries are high in protein, fiber, B vitamins, iron, and antioxidants AND they really taste great. My son describes them as “bouncy in your mouth”. They are actually a bit chewy, but not in a bad way, rather in a substantial, I feel like I’m eating something healthy way. They also have a wonderful, slightly sweet, nutty flavor. 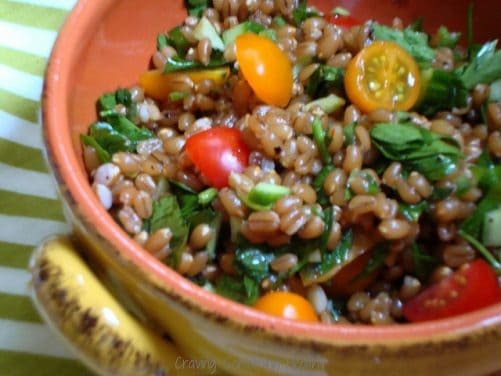 The only drawback to wheat berries is that the take a long time to cook (about an hour). Not so good if you need them ASAP, but great if you planned ahead and made a large batch to last you a few meals. Look for wheat berries in the grains or natural food section of your grocery store. 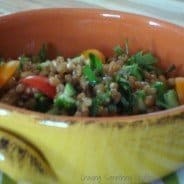 I love them in salads or side dishes, like Grilled Vegetables with Wheat Berries, or this Tabbouleh Salad. They can also be mixed with milk or yogurt and topped with fruit for a high protein breakfast. Kind of like bouncy oats. Remember to make enough for several different dishes – it’s a great timesaver! Place cooked wheat berries in a mixing bowl. Whisk olive oil, lemon juice, garlic together and season with salt and pepper. Pour dressing over wheat berries and toss well. Add chopped herbs, scallion, jalapeño, cucumber, and tomatoes to wheat berries and toss to combine ingredients and coat with dressing. Adjust seasoning with additional salt and pepper. Refrigerate for 15 minutes or so to let flavors blend. Do you have any favorite whole grains? 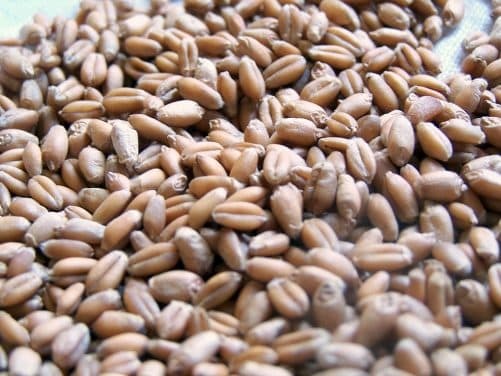 Have you ever sprouted wheat berries or any other grains? That’s on my to-learn list! I love wheat berries! They are so chewy and filling and delicious. 🙂 Using them in tabbouleh is such a good idea!